It’s no secret that we love the Enneagram, and at Watersedge we take every opportunity to talk about the personality theory. Whenever something new about The Enneagram comes out, we’re the first to find them, and we love sharing them with you! Whether you’re new to the Enneagram or an old hand, here are eight of our favourites resources that are well worth your time. When Ian Cron began a podcast dedicated to the Enneagram earlier this year, we were ecstatic. Every week he interviews someone, or a panel, focusing on a particular Type. Other episodes explore relationship dynamics between different Types, approaching Enneagram sceptics, and chatting to other Enneagram teachers. If you love the Enneagram or simply want to know more, this podcast is gold! Listen to The Typology Podcast here. You’ve listened to the Typology Podcast, now what? Ian Cron’s book The Road Back To You is a fascinating and practical take on the Enneagram and how it can shape your life. Connecting it with the holistic spirituality that has shaped it since ancient times, it is well worth your time. Buy The Road Back To You here. Chris Heuertz teaches the Enneagram to people across the globe, and in this spiritually centred book, he discusses how understanding your Type can transform your spiritual journey. It’s easy to get caught up in caricatures and stereotypes, but Chris moves beyond this and delves into the truth behind our greatest hurts and how we can best show love to others. Buy The Sacred Enneagram here. Musician Ryan O’Neal is known as Sleeping At Last, and earlier this year he took on an audacious task: he is writing a song for every Type on the Enneagram. A Type 9 himself, Ryan manages to capture the integrity of each Type in his lyrics, music and delivery. His first track One is out now. Two comes out on November 17. Download One by Sleeping At Last now. Fr Richard Rohr is often viewed as the forerunner of the modern Enneagram movement, and his teaching has shaped the way many people understand the personality theory. If you want to delve into the heart of the Enneagram — and learn from the best of the best — keep a copy of this handy. It’s a great stepping-stone into Fr Rohr’s extensive work about finding and understanding yourself. Buy The Enneagram: A Christian Perspective here. This colouring book blends together the teaching of the Enneagram with the therapy and catharsis of colouring in. Use this to aid you in Mindfulness, meditation or just to relax. All the while, you’ll be learning more about yourself and the people around you. Buy The Enneagram Colouring Book here. Beth McCord is an Enneagram coach based in Franklin, Tennessee, and every day she posts new information about each personality type. From infographics, to prayers and details about the inner workings of each type, Beth’s posts are invaluable and will give you a daily dose of Enneagram wisdom. Follow Your Enneagram Coach on Facebook here. Have you discovered our Enneagram infographics yet? Head over to our Enneagram page, and you’ll find an infographic dedicated to each Type, as well as some fun pop culture takes on the personality theory. 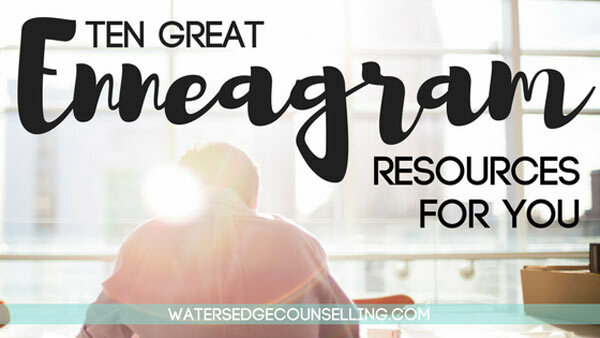 Download your Watersedge Enneagram resources here. The Enneagram Institute is a thoroughly comprehensive site for all things Enneagram. It includes a test, information on each Type, as well as details about their healthy and unhealthy attributes. You can also sign up for a daily email targeted towards your Type, which helps you to work on your personal growth and development. Visit The Enneagram Institute here. This book provides you with a different take on the Enneagram, considering how it affects us in the workplace. Learn about how you can utilise your Type to be more productive at work, work with other Types, and find out how each Type responds to different scenarios and emotions. Buy Bringing Out the Best in Yourself at Work here.